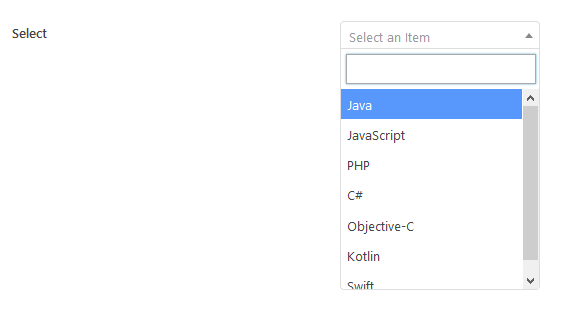 The select advanced field creates a beautiful select dropdown using the select2 library. options Array of 'value' => 'Label' pairs. They’re used to display choices. value is stored in the custom field. Required. multiple Whether to allow select multiple values? true or false (default). select_all_none Display “Select All / None” button to fast toggle choices. Applied only when multiple is true. js_options Array of options for select2 library. See here. allowClear true Allow users to clear selection. width resolve Set width by element’s width. placeholder $field['placeholder'] Make placeholder works just like select field. // Allow to select multiple value? If multiple is false, this field simply saves the selected value in the database. The value saved is the value in the options array (not label). If multiple is true, this field saves multiple values in the database, where ech value is store in a single row in the database with the same meta key (similar to what add_post_meta does with last parameter false). Depends on the value is a single value or an array (multiple or cloneable or both), this function outputs a simple string or an unordered list.